Sadly, after an accident which results in personal injury there's no magic wand to turn back time and make everything better again. Injuries and illnesses can be the source of significant stress and difficulty, but a compensation claim can help victims cope. It might even bring unsafe practices to light and help to make sure that other people don't suffer in the same way. At Thompsons, we want all our clients to have peace of mind when embarking on a compensation claim, so, in most cases, we work on a No Win No Fee basis. 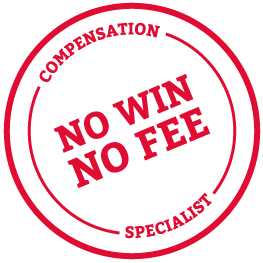 If you are not entirely sure what a No Win No Fee claim is, read on and we will hopefully answer your questions. If you would like to know more, call us today on 0800 0891 331 and speak to a member of our friendly team. What is meant by No Win No Fee? A No Win No Fee arrangement is an agreement between you and your lawyer that means you won't have to worry about paying legal fees if your claim is unsuccessful. There will never be any hidden costs, caveats or small print – so there will never be any nasty surprises at the end of a claim. No Win No Fee means that, whatever the circumstances, if we don't win your case, you won't have to pay a single penny – if we win then a percentage is taken out of your compensation (see below about funding a successful claim). Am I eligible for the No Win No Fee package? Our No Win No Fee package is open to anyone who has either been involved in an accident or developed an illness that is, at least in part, attributable to the actions of another party. Thompsons represents clients from all over Scotland who have been injured in an incident of some kind – perhaps you've been involved in a workplace accident, a road traffic accident, or you're suffering from an illness caused by someone's negligence – wherever you are in the country and no matter what injuries you have sustained, our No Win No Fee package could be the perfect option for you. How will you decide whether I can have the No Win No Fee package? It all begins with a conversation with you,. We will discuss the circumstances of your case with you at a time and location that is convenient to you. We will assess your claim. If we are confident your claim will be successful we will offer you our No Win No Fee product. Sometimes we may need a bit more information to assess your case. We may need to speak to witnesses or see your medical records. If that is the case all of the work that we do to assess your case and to decide if we can take your case on a No Win No Fee basis will be free to you. What are the benefits of No Win No Fee? Claiming compensation has the potential to be a very costly process. Personal injury solicitor fees, court fees, and expert witness fees are all expensive and can quickly accumulate to create a large bill for the claimant, even if the process runs smoothly and the case is settled fairly quickly. In cases where defendants do not admit liability, the case can become much more complex and the associated costs can quickly spiral. By entering a No Win No Fee agreement with a trusted law firm such as Thompsons, you will know that your case probably has a reasonable chance of success, so you can move forward with confidence and focus on achieving the fair amount of compensation for your injuries. If you lose, there will be nothing to pay. What makes Thompsons No Win No Fee claims different? Many personal injury law firms will say they offer a No Win No Fee service, but you must exercise some caution; not all No Win No Fee agreements are the same, and not all will have your best interests at heart. Always make sure you read the small print on such agreements before signing anything. For instance, while it may be true that you will not have to pay legal fees if you lose, you may still have to pay the cost of the outlays – which may include court fees and the cost of recovering medical records. Many will also have other hidden costs that are not made clear from the outset. Thompsons No Win No Fee package, on the other hand, has no hidden costs, so you can be sure you're not going to run into any nasty surprises. And, unlike many other firms, the entire cost of the outlays is covered by an insurance policy. In short, making a claim with Thompsons will ensure you don't run the risk of unnecessary financial loss. How will I fund a successful claim? In short, Thompsons will fund your case for you. As a case progresses there are many outlays and expenses that must be paid including court fees, medical records and expert reports. Without the benefit of a No Win No Fee product or with the wrong No Win No Fee arrangement those costs must be funded by the claimant. That's how Thompsons No Win No Fee service works because we aim to guarantee presence of mind. When you reach a settlement agreement, a small percentage of your compensation will be used to pay our fees. We will always strive to keep our fees to a minimum. It is rare that the amount we require will exceed 20% of the final award (many firms charge a flat fee of 25% of your damages) but this may occur if we are instructed to pursue the claim through a claims management company. This is dependent on the nature of the claim. For instance, if you suffered your illness and injury as a result of an incident in the workplace, then compensation will be paid from the relevant employer's "Employers' Liability Insurance" (it is a legal requirement for all employers to have this type of insurance in place). If you're still employed by the defender, then there are a number of legal safeguards in place to protect you against unfair dismissal on the basis of your claim. If the injury was caused in a road accident, then it will be the liable party's insurer. Sometimes, liability may be spilt, so if your employer supplied you with faulty safety equipment to wear, you may find the damages award will come from two defenders: your employer for supplying you with substandard equipment and the manufacturer for not making the equipment to specific standards. Is there a time limit on making a claim on a No Win No Fee basis? For most personal injury cases, there is a time limit of three years from the date of the accident in which to make your claim. If you're claiming because of an illness, the three-year time limit starts from the date you were diagnosed or when, according to the court, you knew or ought to have known that you were suffering from the illness. Children can however use a legal guardian to make a claim on their behalf before they reach 16. Can a No Win No Fee claim be made on behalf of a deceased family member? Yes, it's possible to claim compensation on behalf of a deceased family member as long as the claim is brought within three years of the date of death. The pursuer dies while making a claim, the estate can continue on his or her behalf. In addition, if illness or accident for which the deceased was claiming compensation was the cause of death then certain categories of the deceased's surviving relatives may have claims in their own right, as long as court proceedings are raised within 3 years of the death. Thompsons' solicitors will offer you and your family the utmost support and guidance during this highly stressful and difficult time. Will the case go to court? No. the vast majority of personal injury cases settle before any court hearing. Many cases settle before court proceedings even begin. Others settle after court proceedings commence but before a hearing of evidence before a judge is set. With the benefit of Thompsons No Win No Fee service you can rest assured that having assessed your case and believe it is a strong one, and one where an offer of settlement is likely. If an offer to settle is made we will give you clear advice on whether the offer is a good one or whether it should be rejected and, with our support, you should fight on for more. What if I was partially liable for the accident? If you feel you were partially responsible for the accident, then you may be concerned that this will affect your chances of success and therefore your ability to make a No Win No Fee claim for compensation. You may be partially liable, for instance, if you didn't follow your workplace's health and safety guidelines, such as not wearing a safety helmet, and the extent of your injury in an incident was worse as a result. If this is the case, you shouldn't let this prevent you from making a claim. Yes, the amount of compensation you're entitled to may be affected, but it's likely the majority of the blame still lies with the other party and the law will be on your side. If you have any concerns over the likelihood of success in your case, contact our solicitors. They'll provide you with honest and straightforward advice. Will receiving the award affect any state benefits I receive? It's likely that receiving personal injury compensation won't affect your ability to claim state benefits. And Thompsons' personal injury solicitors can help you establish a personal injury trust, enabling you to manage your finances in a way that works for you. Can I make a No Win No Fee claim if I live outside of Scotland? You do not have to live in Scotland currently to claim with Thompsons. In fact, many of our claimants now live abroad in France, South Africa, and Australia and in the wider UK. If you worked in Scotland before you moved, you can bring a claim for compensation in the usual way. So, how do I take the first step? If you're ready to take the first step towards receiving compensation on a No Win No Fee basis, get in touch with Thompsons today. You can rest assured you're in good hands with Thompsons. We are one of the most revered personal injury firms in Scotland. Our lawyers have helped thousands of clients successfully claim compensation for their injuries. We win 90% of the cases we take on and secure around £1 million for our clients every week.